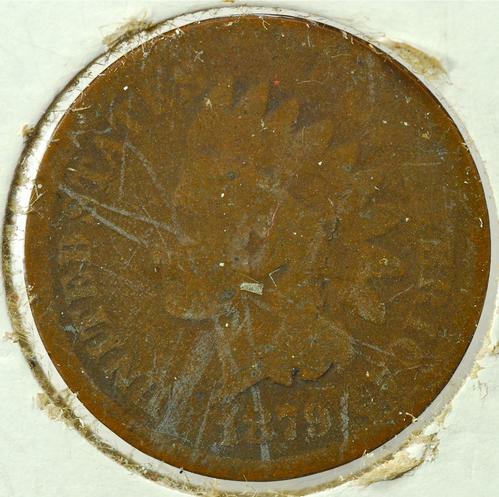 The Indian Head one cent coin, was produced by the United States Mint from 1859 to 1909 at the Philadelphia Mint and in 1908 and 1909 at the San Francisco Mint. It was designed by James Barton Longacre the engraver at the Philadelphia Mint from 1844 to 1869. The obverse of the coin shows "UNITED STATES OF AMERICA," the head of Liberty wearing a feather head dress of a Native American and the year of production. The word "LIBERTY" appears on the band of the head dress. From 1859 to 1864 the design did not feature any mark of the designer. In 1864, Longacre modified the portrait by sharpening the details at this time he added his initial "L" on the ribbon behind Liberty's neck as well. This design would continue largely unaltered until the end of the series, with a minor modification by Charles E. Barber in 1886 when the portrait was changed slightly. Two reverse designs were used for the series. In 1859 the reverse featured "ONE CENT" within a wreath of olive. From 1860 until the end of the series the reverse featured "ONE CENT" within a wreath of oak and olive tied at the base with a ribbon with a Federal shield above. This design continued until the end on the series in 1909 with a minor modification by William Barber in 1870. The coins struck between 1859 and 1864 contained 88% copper and 12% nickel. Due to the hoarding of all coinage during the Civil War, the nickel cents disappeared from daily use and were replaced in many Northern cities by tokens. The success of these copper tokens prompted the change of the cent to a similar metal. In 1864, the alloy changed to Bronze (95% Copper and 5% Tin and Zinc), and the weight of the coins was reduced from 72 grains to 48 grains. This weight continued for copper-alloy U.S. cents until the 1982 introduction of the current copper-plated zinc cent (about 38.6 grains). The total production of the Indian Head cent was 1,849,648,000 pieces. The 1909-S had the lowest mintage, only 309,000. It is not considered as scarce as the 1877 issue, (852,500), since fewer of those were kept, particularly in the higher grades.